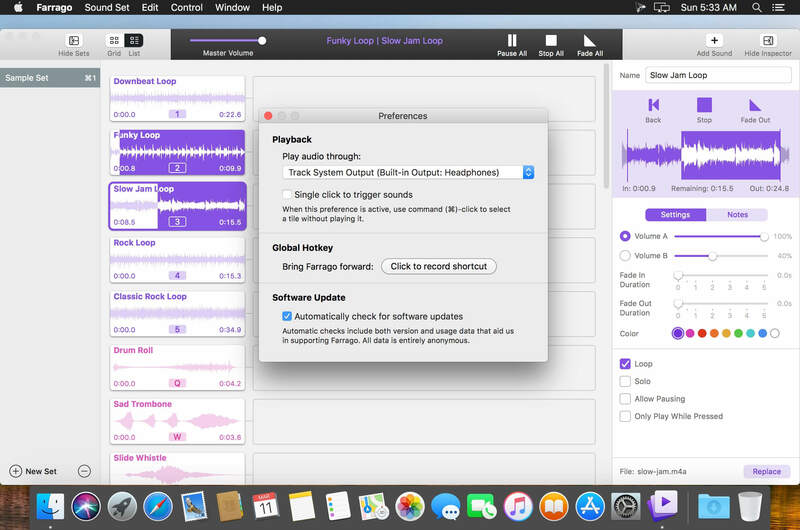 Farrago provides the best way to quickly play sound bites, audio effects, and music clips on your Mac. 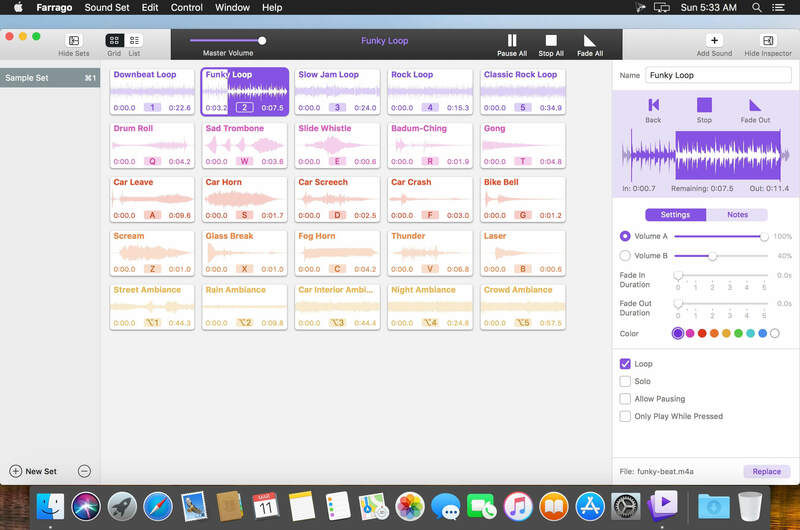 Podcasters can use Farrago to include musical accompaniment and sound effects during recording sessions, while theater techs can run the audio for live shows. Whether it's providing quick access to a large library of sounds or running through a defined list of audio, Farrago is ready to assist! Powerful Tile Interface: Farrago's tile grid lets you lay out your audio exactly how you want it. Put your sounds at your fingertips and work the way you want. Customize With the Inspector: Use the inspector to tailor each sound's settings to your needs. Set the tile name and color, tweak in/out points, alter fade settings and more. 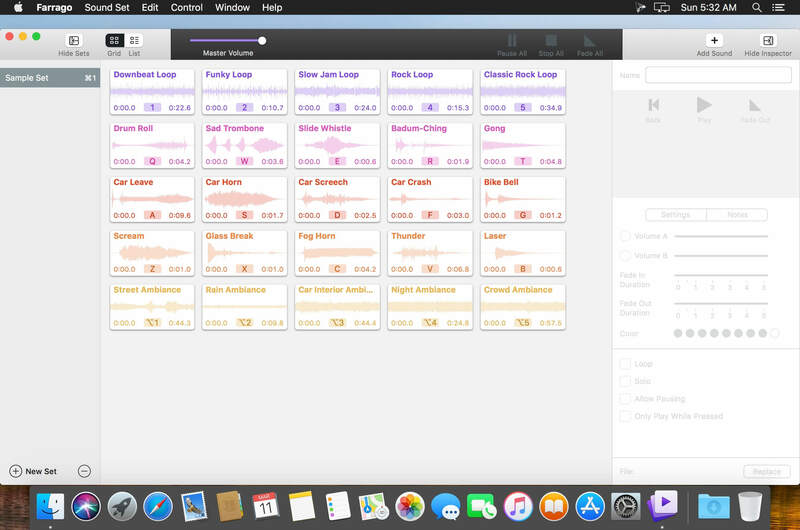 Organize With Sets: Create distinct groups of audio based on mood, show, or any other critera you like. Using sets makes managing audio a breeze. Sound Sets: Farrago's default sound set is useful, but you can create your own sets based on show, mood, or anything else you like. A Thoughtful Interface: Farrago's tile-based layout provides an easily understood way to play your audio via the keyboard or mouse. Global Access via Hotkeys: With Farrago's user-definable Global Hotkey, you can pull the app forward, then use the in-app shortcuts to instantly trigger your desired audio. The “Missing Device” warning is now intentionally delayed for 5 seconds, to avoid warning when a device briefly disappears. The Tab key will now move focus between the Sets list and the selected sound set. Sets in the Sets list will (once again) re-sort themselves into alphabetical order promptly when a set name is edited. The Sets list now resizes nicely when its scrollbar shows or hides and better handles scrollbars in general. A rare problem where very tiny or corrupt audio files could hang Farrago has been fixed. A regression that caused all clips to load at launch unnecessarily has been fixed.